The Pit is pleased to present Laurie Nye: Venusian Weather. An opening reception will be held at the gallery on April 29, 2018 from 4-7pm, and the exhibition will be on view through June 10. Also on view will be Mindy Shapero: Second Sleep in The Pit II. Envision the Andromeda Galaxy, seen faintly in the night sky from here on Earth. It is unimaginably distant and huge, yet it is on a collision course with the Milky Way. Four billion years from now, the two bodies are predicted to merge, forming a giant new galaxy. Is there life in the Andromeda Galaxy, and do they know how our fates may intersect? The possibility of life beyond Earth is a driving force behind Laurie Nye’s paintings. Her ongoing narrative of an alternate reality existing in the simultaneous present is centered in Andromeda, a community of female beings who seek to restore ecological balance to the universe. In Venusian Weather, Nye explores humanity’s struggle to control its relationship with nature via the Andromedans’ perception of environmental disaster on Earth. As a student of mythology and science fiction alike, Nye looks both backward and forward, challenging the notion of linear time in the centerpiece of Venusian Weather, an architecturally-scaled, cosmographical frieze that describes what is and what has been at stake on Earth through the Andromedan gaze. Inspired by Mark von Schlegell’s 2005 novel Venusia, Nye portrays the world as a hologram, represented in her paintings as gridded non-spaces that recall Star Trek’s holodeck virtual reality environments. The grids mingle with and interrupt depictions of transformation and flux amid multiple realities. Nye’s brightly hued, eloquently painted compositions conflate the chaos of present-day Earth with dreams of a radiant future on Venusia in a hopeful vision of love, peace, and environmental harmony. Laurie Nye was born in Memphis, Tennessee in 1972 and lives in Los Angeles. She earned a BFA from the Memphis College of Art in 1995 and a MFA from the California Institute of the Arts in 2002. 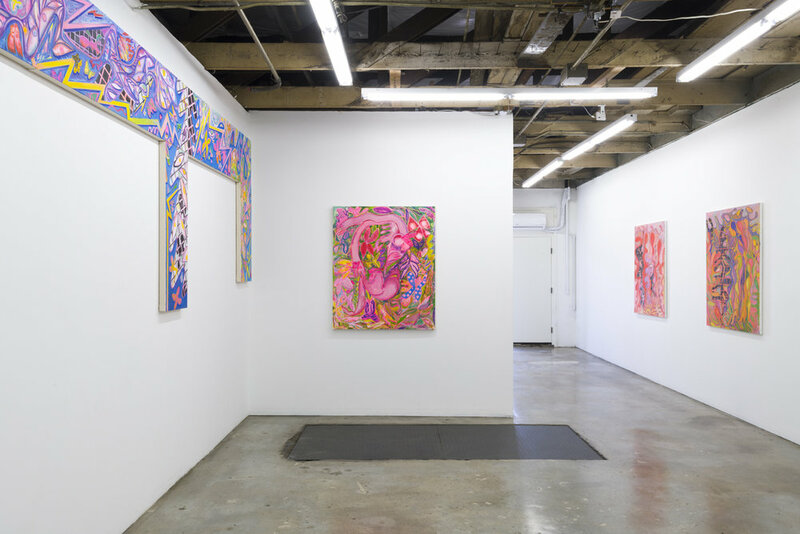 Nye’s work has been featured in one and two-person exhibitions such as Andromeda, Five Car Garage, Los Angeles, CA (2015) and The Crystal Eaters, Statler & Waldorf Gallery, Los Angeles, CA (2013). Her work has been included in thematic exhibitions including Moving, Still, Monya Rowe Gallery, St Augustine, FL (2017); Filtergeist, Open House, Brooklyn, NY (2017); Flying Man Revolved, Dread Lounge, Los Angeles, CA (2017); Super Bloom, PostLA, Los Angeles, CA (2017); Forest at The Edge of Time, The Pit, Los Angeles, CA (2017); Figure it Out, The Dot Project, London, (2016); and The White Album, Richard Telles Fine Art, Los Angeles, CA (2014). Nye is a member of the all-female collectives Witch and Chameleon and The Binder of Women. 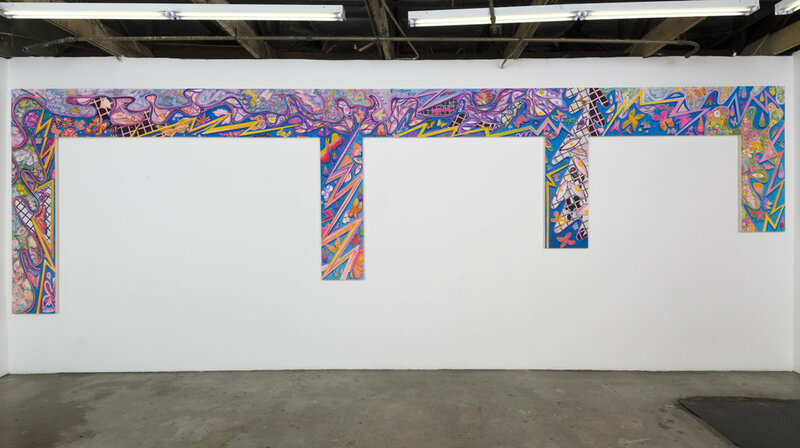 Her recent curatorial project The Airtight Garage was presented at Big Pictures, Los Angeles, CA.